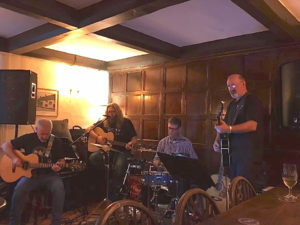 Big Sky is a local band that plays roots rock infused with touches of blues, country and psychedelia and one of the few bands containing brothers who have not had an on-stage altercation, yet! The band started life as an acoustic 3 piece about 7 years ago and has slowly transformed into a fully electric 4 piece with the current line-up that has been together for just over 2 years. Big Sky covers everything from traditional folk to classic rock, stopping off at most points in between and has recently started performing their own material with a gig at Bristol’s prestigious venue ‘The Fleece’. Andy plays electric guitars, enhanced through his synthesised box of tricks. Phil handles the bottom end on bass along with his magnificent electric wardrobe. Jem is the band’s latest addition – drummer, brother of founder member, singer and acoustic guitarist, Julian. Big Sky will be playing their full electric set the evening before at The White Hart and an acoustic set the following day at the Bell Inn for the Big Free – be there!